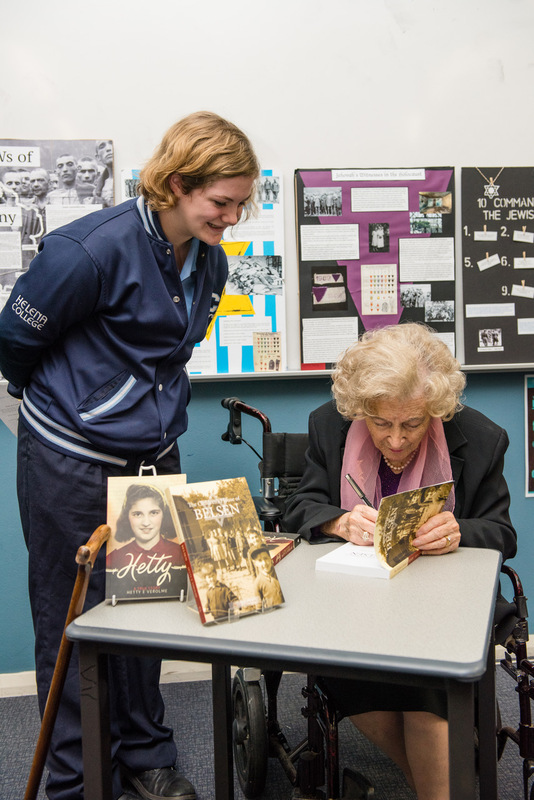 Hetty visited Helena College last week and spoke to the Students about her mission to educate and inform as many children as possible about the realities of the Holocaust. As a Survivor of the WWII atrocities committed by the Nazi regime, Hetty recounted her teenage years before being transported to the then exchange camp, Bergen Belsen Concentration Camp near Celle in Germany. She recalled the trauma of being separated from her parents and being held along with her two brothers Maxy and Jacky Werkendam and other quite young children, in what was called the Children’s Barracks, number 211. The students were most impressed with Hetty’s attitude to life and her energy at 87 years of age. Two newspaper articles were written about the visit to the College, one by Andrew Carter from Echo News and hopefully we will share these with you shortly. It almost seems inconceivable that there was ever a time in Australian history, when there was a need to gain an understanding, of different Ethnicities. A vision of how to smoothly integrate the vastly growing New Australian population, into the typical Aussie life style was formulated, by the late great Malcolm Fraser. Michael MacKellar was the Minister for Immigration and it was he, who appointed Hetty to the Ethnic Affairs Council. On Australia Day 1977, the Australian Ethnic Affairs Council was created which changed the entire social structure of Australia. Their recommendations called The Green Paper was accepted by both sides of Parliament without any alterations in 1978. Even today one can find much evidence of this effect. The Australian Ethnic Affairs Council was divided into 4 Committees. Hetty was part of the Committee for Public Consultation and Ethnic Media and it was their recommendation to establish SBS. Hetty seen here unpacking the imported Dutch goods in readiness for the 1st Dutch Festival in Adelaide. Hetty was also the first female President for the Netherlands Society in Adelaide a position she held for nearly a decade. The German President visited Bergen Belsen this 70th anniversary of the liberation of the camp where there are many many mass graves left untouched with but a few headstones. An acquaintance of Hetty’s a well known historian, and author himself of many books, Hans-Dieter Arntz, has written a book called The Last Elder of Bergen Belsen -Josef Weiss. Hans-Dieter also went to Belsen this year. It seems The President of Germany Joachim Gauk, sent a letter to Hans-Dieter and added his very special greetings to the Family Verolme and Weiss – dated May 2015. Speaking to Hetty of Hans- Dieter today , she said “He sent me a copy of the actual letter he received from the President of Germany, where the President sends his personal Greetings to Family Verolme and Weiss”. Hetty said she was especially honored to have received words from two European Presidents during her tour in May. “I find it unbelievable” she said with excitement “that now a second President in Europe has done this”. The first recognition came from The Italian President Sergio Mattarella, who opened the book Fair in Turin” she said. Hetty was a guest speaker there when President Mettarella gave Hetty an honorable mention in his opening speech, that day, 14th May 2015. Hetty will be speaking at the University of Seville tomorrow May 6th 2015 in the Salon de actos de la Facultad de CC. de la Educacion (The university Auditorium) at 16.30 – 18.30. If you been unable to see her talks this tour, now would be the perfect opportunity to catch up with her for this event. The recent release of Spanish version of Hetty’s Book – The Children’s House of Bergen Belsen will be the highlight of this event. Hetty’s Forefather Mozes Werkendam was born in Werkendam in 1737 and she was invited by the Werkendam Council, as a special guest to give a lecture, at the 70th year commemoration of the ending of WWII. Many questions were asked on the open mike, afterwards and was then followed by her usual book signing with a very long line of eager fans. Hetty is very generous of her time at her book signings and always gives a special message to each and every fan who has queued. The long queue of fans wanting Hetty to autograph their books. thanks to Sylvana de Baker for these wonderful images and videos.